For each facing material it is important to choose the right adhesive composition, which will ensure the reliability and durability of the coating. The porcelain tile imitating a natural basis differs not only the improved esthetic indicators, but also the increased durability. However, its ability to withstand significant loads directly depends on its installation, where the type of adhesive mixture used plays a key role. After reading this article, you will know which glue is best for porcelain stoneware used in certain conditions. Ceramic granite, which appeared in the 70s of the last century, rather quickly occupied a worthy place in the market of finishing materials, having pressed at the same time a ceramic tile and having made a serious competition to products from a natural stone. From the point of view of physical and mechanical properties, it is absolutely unique. A rich assortment of color solutions allows you to create aesthetically attractive coatings, almost regardless of the application of the material. The most relevant today is the use of porcelain stoneware at sites with increased operational load. In particular, this applies to railway stations and airports, metro stations, large trade pavilions, industrial premises and industrial warehouses. At the same time, finishing work involves careful selection of the adhesive composition, based on both the characteristics of the material itself and the conditions in which it will be used. In the process of laying porcelain stoneware, it is necessary to use strictly specialized mixtures. 2. The stiffness of porcelain tile , which does not allow the products to bend, and, at the same time, makes them quite fragile under the influence of increased loads and temperature drops. The adhesive composition must be sufficiently elastic to compensate for the maximum tension between the outer coating and the base on which the tile is laid. This applies to finishing not only objects with high traffic, but also balconies, verandas, terraces. In addition, the indicators of elasticity play an important role, if under the surface to be veneered installed system "warm floor". 3. Material resistance to temperature differences , due to which it can be successfully used for finishing the terrace or when decorating the porch. Based on the climatic conditions of a particular region, it is possible to determine which frost-resistant glue for porcelain tile is better to choose for outdoor use. The number of cycles specified in the specifications must be at least 50. When choosing an adhesive for porcelain stoneware, in addition to adhesive and strength characteristics, it is necessary to consider the conditions of operation and installation porcelain stoneware. A feature of this glue is the minimum working period of the ready-made mortar. Final hardening occurs after 3 hours, while other formulations seize no earlier than in a day. In this case, the use of the surface is allowed almost immediately after finishing. However, it is inconvenient to use a quick-hardening adhesive to work with large areas, since the prepared solution must be consumed within 30 minutes. Such formulations are great for facing walls inside buildings, in particular when decorating a kitchen apron, but can also be used during some types of outdoor work. Plaster or screed is usually used to remove large uneven ground. However, minor bumps and depressions will not interfere with the finishing process, if you know exactly which tile adhesive for porcelain stoneware is better to choose in such a case. Leveling adhesives are used both for facing surfaces inside buildings, and for laying facade coatings. At arrangement of balconies, penthouses, terraces or ground floors such glue often allows to do without preliminary processing of the basis. Under the operating conditions of warm floors, as well as heated internal walls, deformation of the tile is often observed, resulting from changes in temperature. Adhesive with optimum elasticity will help prevent cracking of porcelain stoneware.For interior surfaces of swimming pools, where tiled flooring is subject to constant external influences, it is recommended to use highly elastic compositions. In addition, such mixtures perfectly fall on various building materials, including drywall, plywood and any wood species. In this case, the name of the composition speaks for itself. The ability of heat-resistant adhesive to withstand elevated temperatures makes it possible to use it when facing highly heated surfaces. To understand what kind of glue to choose for porcelain, you need to determine the level of maximum temperature, which reaches the base. The most resistant to thermal effects is a mixture designed for finishing fireplaces and stoves. It is designed for temperature conditions in the range of 600 ° C. In addition, there is a heat-resistant glue for porcelain. For interior finishing work, facing material is often chosen in the form of large-format products used, as a rule, when creating floor coverings. In this case, the estimated thickness of the layer of adhesive used should be at least 10-12 mm. It should be borne in mind that for external work are separate types of mixtures. The main difference of the glue, which provides the most reliable fixation, is its ability to withstand significant loads. Mostly such tools are used to work with large-format plates that can be placed on a horizontal base, and on any vertical surface. For tiles used in conditions of low ambient temperature, a special mixture is used, including water that does not collapse. Basically it is used to finish the surfaces of balconies, terraces, plinths. In addition, such mixtures have proven to be a reliable fixer for polystyrene foam, mineral wool and other heaters. Today you can find tile glue for sale on various types of facing materials, including porcelain stoneware. In this case, the mixture is supposed to be used both for interior surfaces and for some exterior works. 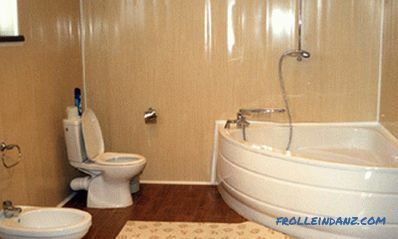 Such compositions are suitable for most products that have standard sizes. Excluded only their use when laying large-format tiles. Next we offer you an overview of the best brands and manufacturers of ceramogranite glue. Litokol is an Italian brand that produced its first tile adhesive in 1968. After 10 years, the production of one-component pasty materials, which do not require complicated preparation procedures, was established. Currently, for the manufacture of adhesive mixtures are used the most honed for many years of work technology, as well as modern high-precision equipment. This makes it possible to constantly increase the number of products produced in automated production. 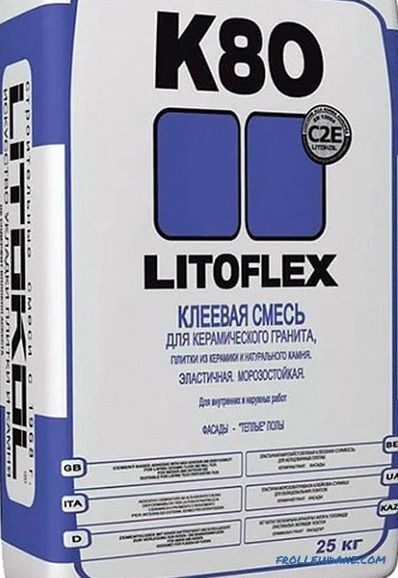 Litokol Litoflex K80 is a cement-based compound whose elasticity is achieved due to the presence of special additives that also provide improved adhesion. High rates of water and frost resistance allow using this mixture both for finishing rooms with high humidity and for outdoor work. Laying of facing material on deformed as a result of temperature or mechanical effect of the base is allowed. 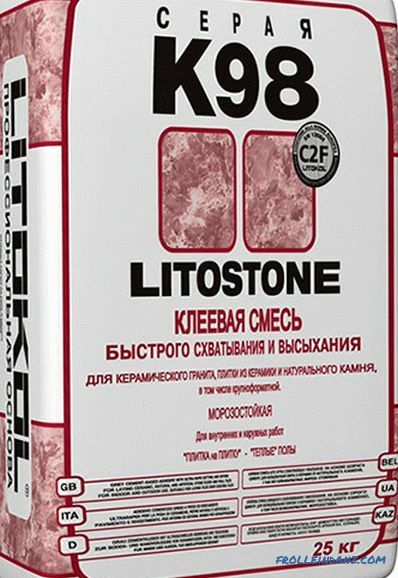 Litokol Litostone K98 is an adhesive that has elevated frost resistance. It is made on the basis of cement and can be used for laying both tile or porcelain stoneware, as well as any kind of natural, as well as artificial stone. Due to its ability to withstand low temperatures, this mixture is excellent for finishing facades and arranging other coatings operated outdoors. It is allowed to use the composition in areas with high mechanical load, provided that the facing material is not prone to deformation. 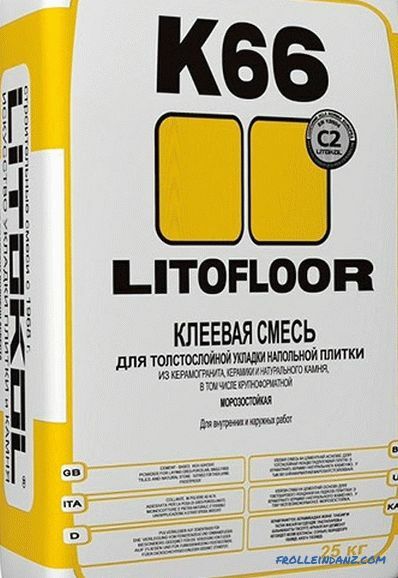 Litokol Litofloor K66 is a tile adhesive designed for the installation of floor coverings. The main component of the dry mix is ​​high-quality Portland cement, to improve the properties of which the manufacturer uses special chemical additives. The material completely hardens during the day, showing perfect adhesion and avoiding shrinkage of the tile. 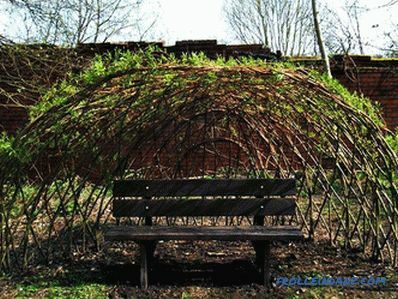 Characteristics of water and frost resistance allow its use, including, for outdoor use. Ceresit is a product from Henkel, which was born more than a hundred years ago and operates in different directions of chemical production. At present, numerous Henkel production sites operate in the CIS, including those engaged in the manufacture of adhesive mixtures for tiles manufactured under the Ceresit brand. If you ask which tile adhesive is better for porcelain stoneware, then it should be noted that most consumers prefer to use specialized formulations of this brand. 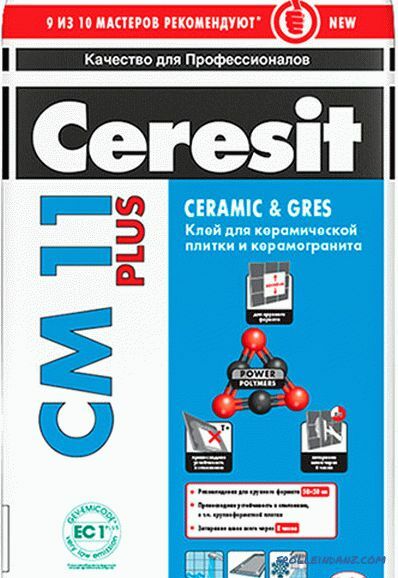 Ceresit CM 11 Plus is a mixture that is also suitable for outdoor use. However, in cases of laying porcelain stoneware, only internal use is allowed when installing tiles with dimensions not exceeding 50x50 cm. The glue is intended for vertical and horizontal coatings in rooms with moderate humidity, where the base is concrete, cement screed and other types of non-deformable surfaces. Under special conditions, it can be used in combination with elastic emulsion SS 83. 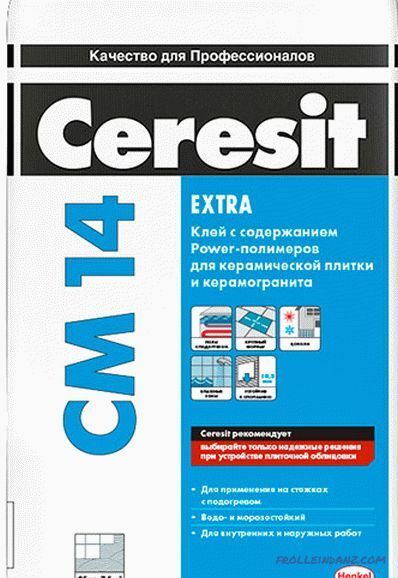 Ceresit CM 14 is an adhesive that provides a reliable fixation of tile or porcelain stoneware, as on a horizontal one, and vertical surface. Perfectly suited for a coating that is used in a current floor heating system. Allowed to use this composition in bathrooms and other rooms with high humidity. For exterior decoration of the building is used only in work with artificial stone, made on cement base. The maximum allowable size of the mounted elements is 45x45 cm. 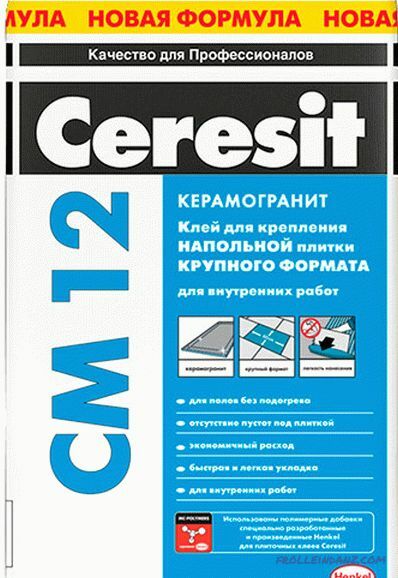 Ceresit CM 12 is a waterproof adhesive designed for the installation of floor coverings made of porcelain stoneware and other tile products. It is used exclusively for interior work, including when laying large-format elements with dimensions up to 60x60. Suitable for rooms with high humidity. Well fixes the coating mounted on the waterproofing material CR 65. The scope of application of this adhesive means is significantly expanded when the elasticizer CC 83 is added to the mixture. 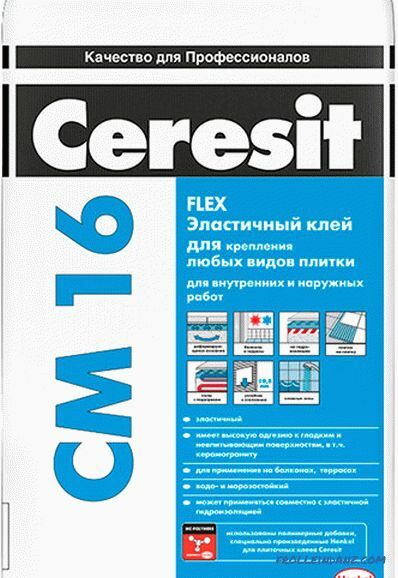 Ceresit CM 16 - the glue calculated on any types of tile, admissible to use as in external, and internal finishing works. 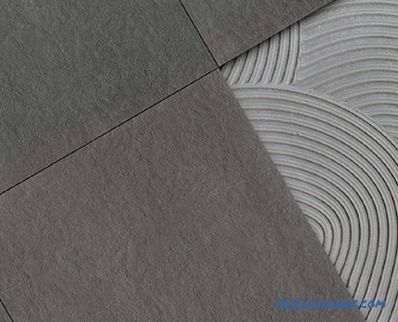 As a cladding material can be used conventional tiles, ceramic granite, clinker tiles, as well as products made of stone, with the exception of marble. This composition has high adhesion properties, regardless of the characteristics of the base on which the coating is mounted. Equally well fixes the finishing elements on horizontal and vertical bases. 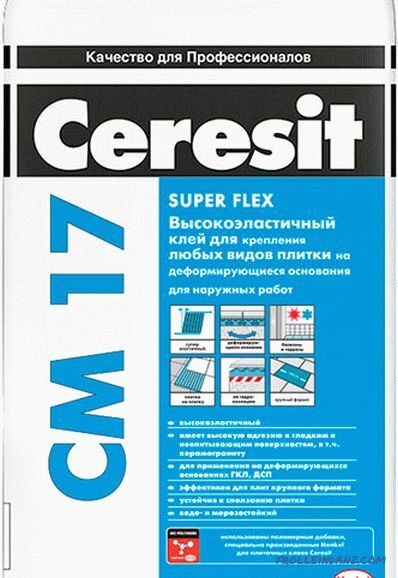 Ceresit CM 17 is a special type of glue, the main use of which is complex, non-standard and subject to deformation of the base. It is used for laying completely different floor and wall cladding materials, including porcelain stoneware. The base can be drywall, screed with a built-in heating system, painted structural elements, etc. It is possible to fix the facing material without first dismantling the old tile covering. 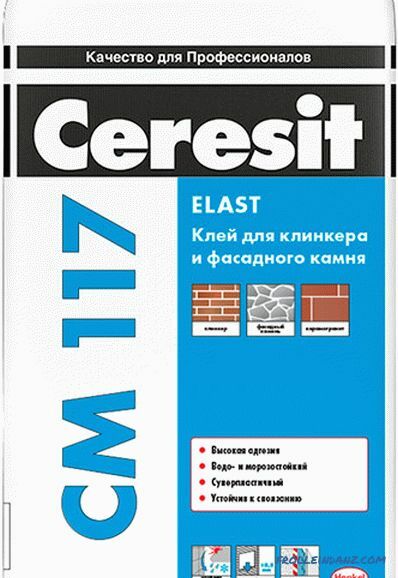 Ceresit CM 117 is an adhesive for fixing tiles to a rigid base. The quality of fixation is not affected by environmental conditions, so the tool can be used both for interior work in arranging heated flooring, and for exterior finishing of various objects, including indoor pools. High adhesion virtually eliminates slipping tiles from a vertical surface. For deformable bases, it can be used in combination with the elasticator CC 83. 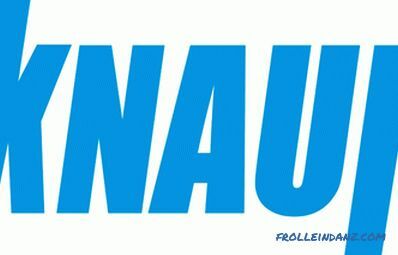 Knauf is a German company whose products have positively recommended themselves due to rather high quality indicators . If you do not know which glue for porcelain tiles to choose from those offered by the domestic market, we can safely say that the compositions represented by this brand are among the most universal. Each mixture is designed to work with a specific type of coating, which guarantees the longest possible service life. Many masters especially distinguish adhesive mixtures of the Flizen series, since due to their transparency, the facing material remains clean during the installation process. 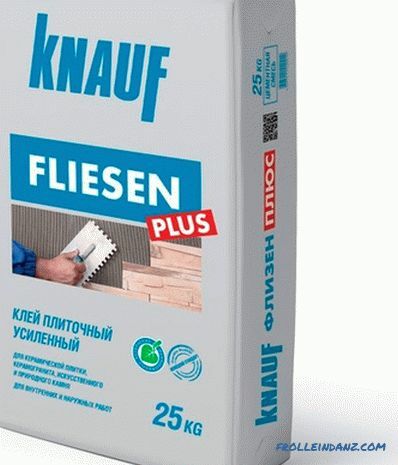 Knauf Flizen is a mixture used for both interior and exterior decorating. It can be used when arranging vertical coatings, however, in cases with porcelain stoneware, it is assumed that the material is laid on the floor, and exclusively inside the building. The maximum allowable tile size is 60x60 cm. It is necessary to comply with the requirements for the base: the surface must be flat and not subject to deformation.This glue is quite economical, due to the possibility of thin-layer deposition. 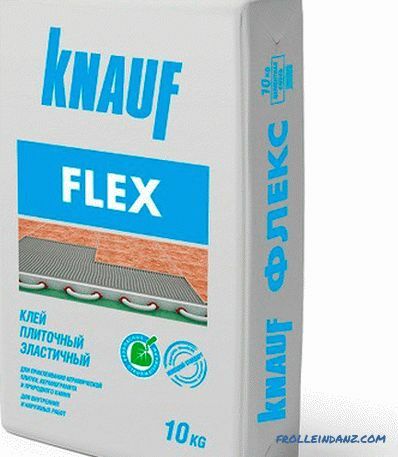 Knauf Flex is an elastic adhesive that can be used when installing wall or floor coverings. 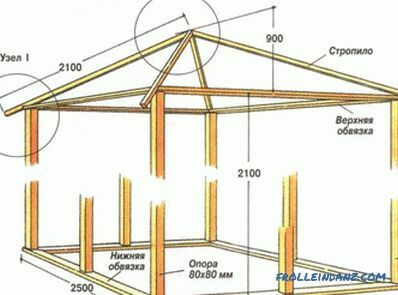 In this case, it means both interior work and finishing of the external structural elements of the building, including the terrace or basement. 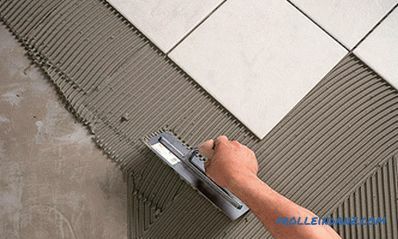 Glue provides a reliable fixation of almost any tile materials, including porcelain, without limiting the choice of products by size and weight. The hardened mixture is able to withstand significant loads, as well as to resist the effects of moisture and low temperatures. 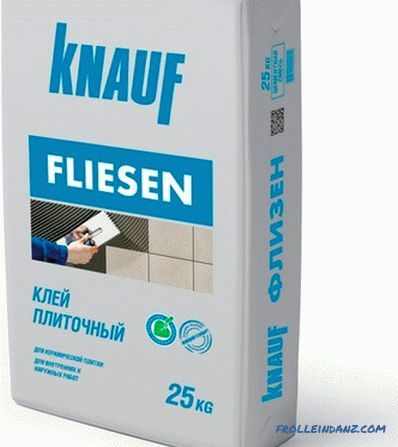 Knauf Flisen Plus reinforced is an adhesive with improved adhesive properties, designed for laying facing materials on vertical and horizontal surfaces. Products made of porcelain stoneware, the size of which does not exceed 60x60 cm, can be used as floor covering elements. At the same time, the concrete base should be pre-aligned. It is also possible to install tiles on drywall and other lightweight structures. It is allowed to use this type of adhesive mixture when arranging the "warm floor" system. 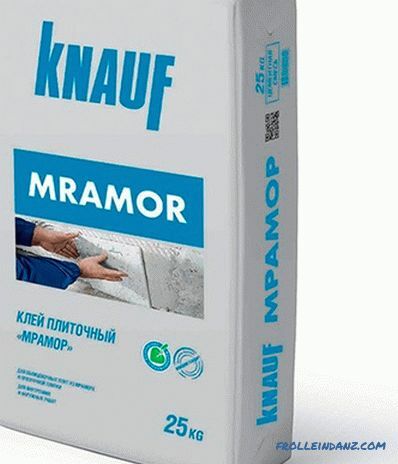 Knauf Marble is a special adhesive compound designed to work with products made of marble, granite and other types of natural stone. It can be used for finishing walls and floors with traditional facing materials, in particular, with tiles and porcelain stoneware. The highest adhesion allows you to use this mixture for reliable fixation of coatings in conditions of significant temperature fluctuations. However, the base should be non-deformable and have a completely flat surface. 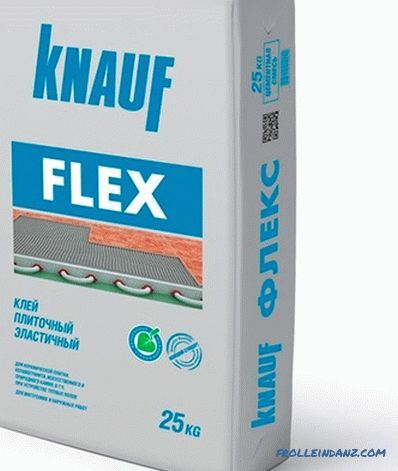 Knauf Flex with enhanced elasticity is an adhesive used in places with high traffic, as well as for lining surfaces that experience constant loads. Ceramic granite in this case, like any other finishing material, must be laid on a perfectly flat base. To prepare the floor, the screed is often poured, and the walls are leveled with cement-sand plaster. Flex refers to water and frost-resistant means, and is also able to withstand thermal effects. Weber Vetonit is one of the leaders in the production of dry adhesive mixtures. 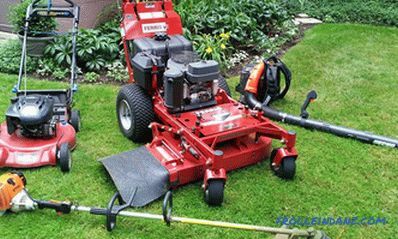 Products manufactured by this company are manufactured using advanced techniques, and technical equipment includes the most modern high-tech equipment. This allowed not only to achieve the highest operating performance, but also to establish an automated production process, so that the cost of materials became available for different categories of consumers. 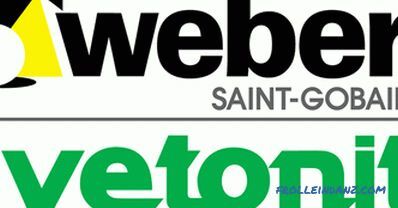 Weber Vetonit occupies a leading position. The product range includes various formulations that are in demand when lining certain objects. Weber. 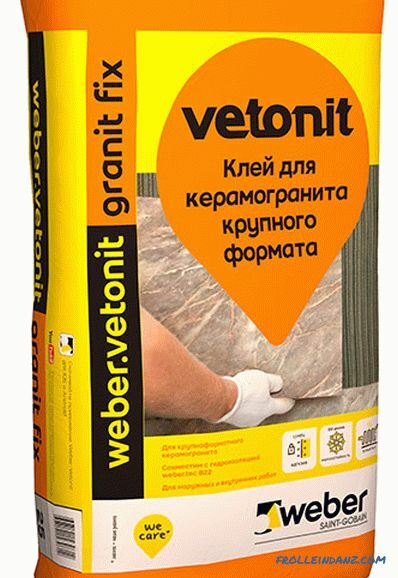 Vetonit Granit Fix is an adhesive with which you can level the surface, easily compensating not only the unevenness of the base, but also moderate deformation of the facing material, which is due to the high elasticity of the mixture. This composition is used for the installation of porcelain stoneware, as well as any types of ceramic tiles, including products made by the method of double firing. Laying on both horizontal and vertical surfaces is allowed when performing interior or exterior decorating. Glue is frost resistant. Weber. 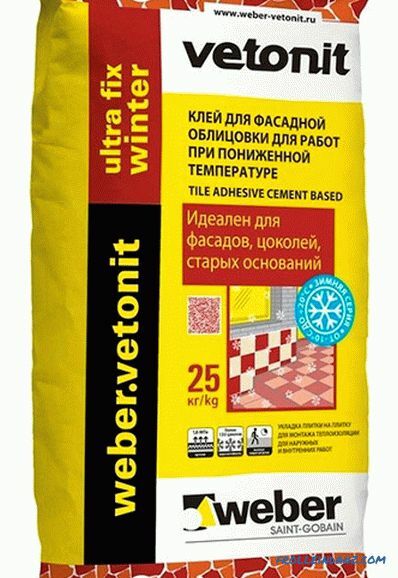 Vetonit Ultra Fix Winter is an adhesive designed for facades at temperatures below zero. The characteristics of the mixture allow the installation process to dispense with the use of heating devices. This includes laying porcelain stoneware or large ceramic tiles. Frost resistance indicators according to GOST - at least 150 cycles. The mixture is excellent for coatings subject to abrasion. In addition, lining materials can be attached directly to the waterproofing. Weber. 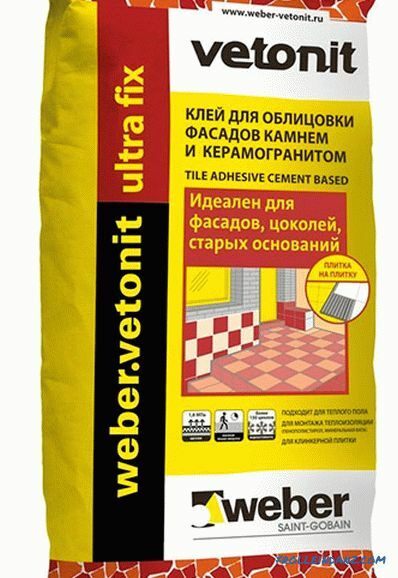 Vetonit Ultra Fix - composition recommended for use when performing outdoor work. Due to its high adhesion, it is able to reliably fix not only ordinary ceramics and porcelain stoneware, but also massive stone products, regardless of their format. Also suitable for different types of mosaic. 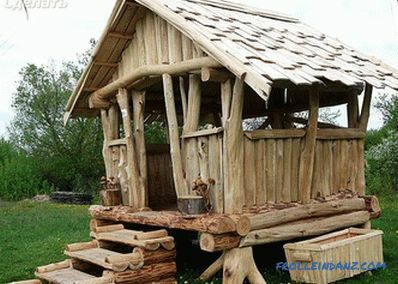 The main area of ​​application is the facades of buildings, all kinds of extensions and basements. Weber. 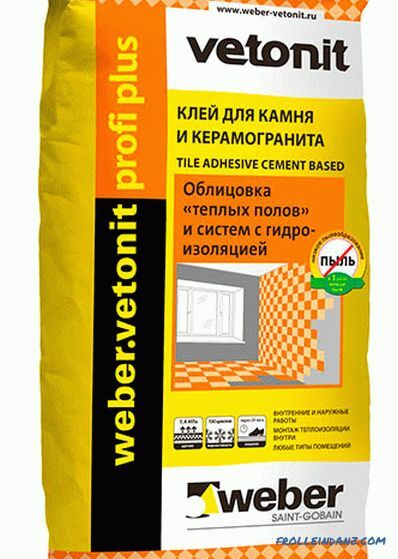 Vetonit Profi Plus is an adhesive compound that has optimal adhesive properties and is characterized by high elasticity.It is noteworthy that in the process of preparing the solution there is practically no dust in the room, due to which the composition is ideally suited for use on objects with complete interior decoration. External installation of ceramics, clinker or porcelain stoneware is also allowed. As the basis for laying can be a variety of materials, including hisboard. Weber. 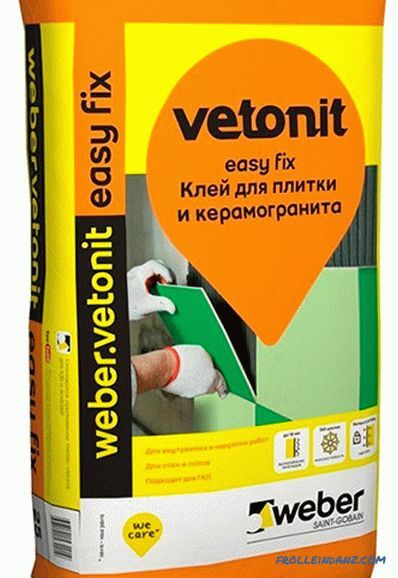 Vetonit Easy Fix - glue, characterized by high moisture resistance. It is mainly used for interior work when finishing horizontal and vertical surfaces in rooms with a high level of humidity. In combination with ceramic granite, it exhibits perfect adhesion abilities. It withstands more than 100 freeze-thaw cycles, which allows its use when finishing the exterior surfaces of a building.